Make a difference in our community by hosting a bin! 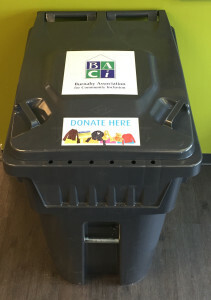 You can make a big difference in the lives of people with disabilities in an easy, no-cost way – by hosting one of the donation bins that BACI is placing in key locations throughout Burnaby. Keeping items out of landfills. Recognized for making a positive contribution to your community. What do BACI Outdoor Bins look like? 43” deep, and 71” tall (4.5 ft x 3.5 ft. x 6ft.). See the BACI Bin Map for current locations. What do BACI Indoor Bins look like? Our popular indoor bins are the size of a large plastic recycling bin on wheels, and are 23″ wide, 34″ deep, and 39″ tall (1.9 ft x 2.8 ft x 3.25 ft). How are BACI Bins maintained? As the bin owner, BACI is responsible for keeping bin locations neat and orderly. Our drivers maintain and empty the outdoor bins 5 days a week for your convenience. Additional pick-ups may be scheduled as needed. Indoor bin pick-ups are arranged on an as-needed basis. We hope you will join us in making a difference in the lives of people with disabilities and their families, and in creating more caring and inclusive communities. If you have a business or commercial property (or know someone who does) where a BACI Bin would have high visibility for donations, please call 604.299.7851 or email carol.broomhall@gobaci.com. Not able to host a bin? 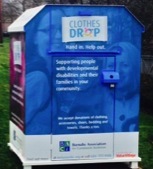 Host a clothing drive at your work or school! Get your co-workers or friends on board with our Clothing Drive flyer!